“The giant of Happy Valley Esquivalt(?) [sic]. Sent to Professor Flower at Nat Hist Mus and returned to the owner Left McCallum.” Source: British Museum. When I was looking for more information about the Coast Salish grave houses I pictured a few days ago, I ran into these images from the British Museum. 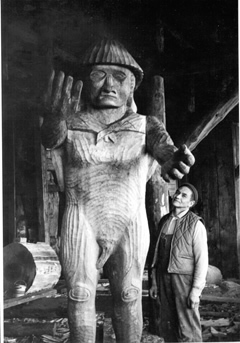 They show the torso and head of a large human figure, carved out of wood. The height of the sculpture is 4 foot 9 inches, meaning the whole sculpture, assuming it once had legs, would have stood well over seven feet tall. So, a giant indeed. There is very little information about the sculpture, other than it comes from happy Valley, “Esquivalt” – clearly meaning Esquimalt – a neighbouring municipality to the west of Victoria. The next municipality to the west is Colwood, and indeed it has a prominent “Happy Valley Road” running through it into Metchosin. While at the first glance the sculpture doesn’t appear to be a typical NW Coast sculpture, I think there’s reason to at least consider that possibility. Detail, the “giant of Happy Valley Esquivalt(?) [sic]. Sent to Professor Flower at Nat Hist Mus and returned to the owner Left McCallum.” Source: British Museum. I’m no expert in any of this, but bear with me. The caption suggests it was taken to Professor Flower at the Natural History Museum, and while elsewhere the photo is described as “early 20th century” Professor Flower, also a noted amateur Anthropologist, retired in 1898 and died in 1899. I’d suggest this dates the sculpture to no later than the late 19th century. 1. Monumental, naturalistic sculpture is well known from historic Coast Salish settlements and particularly graveyards. We saw just such an image in my last post here. The sculpture is made of a single piece of wood, and is heavily weathered, so we can infer it spent a lot of time outdoors. The description reads “Photograph (black and white); profile of a carved wooden human torso on a plinth, from Vancouver Island,” but it’s not really on a plinth, in fact it is just on an ad hoc stack of slabs and leans back on some cloth pressed against the wall. 2. The sculpture appears to have had its arms cut off and also to be cut off, crudely, at the hips. I suspect this happened to make it more convenient to pack in a crate back to the UK. On the profile below you can see what look like false-starts by the saw used on the shoulders. It also makes it fit with a European tradition of broken torsos. Whether the arms were spread wide (necessitating joinery I suspect) or, more likely, bent to the front, it’s hard to say. 3. The frank depiction of external genitalia would be unexpected in Victorian Canada settler society. However, some of the large, naturalistic “welcome figures” on the NW Coast anatomically correct – see this Coast Salish example by Simon Charlie. 4. The owner of the sculpture took it to a Natural History museum where it was photographed, suggesting to me it was not considered to be fine art carved by an artist of European descent. Indeed, the owner took it to an amateur Anthropologist at the museum. I think that’s what you would do at the time if you suspected or knew the sculpture was non-European in origin. The owner is listed as “Left McCallum” which could be “Lester” or, I suppose, Lieutenant. By the way, there is a McCallum road not that far from Colwood, near Florence Lake. I’m sure someone knows who this McCallum is. 5. 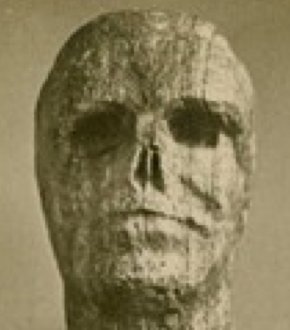 The face is carved as a strange mixture of skull-like and life-like components. The eyes are rectangular sockets. The vomer is clearly visible, though the nose itself is seen in the profile, below. Yet the lips are carved, and the face lacks the toothy rictus of a typical representation of a skull. However, close attention to the lips shows them to be very wide, down-turned and almost stylized in a way familiar to NW Coast formline art. Interest in the ribs is something one commonly sees in pictographs and petroglyphs, and on this sculpture as well. Indeed, compare this Salish spindle-whorl with prominent ribs and lips, navel, and exposed genitalia. 6. The head appears to have a groove or indentation around the brow, making it easy to fit a hat to it, as in the previously-cited example. 7. Where Happy Valley Road meets Metchosin Road near Parry Bay is an area with particularly numerous defensive sites, village sites and a rich funerary landscape. Equally, Happy Valley itself appears to drain into Witty’s Lagoon, also an area of high cultural importance close to Albert Head. A large sculpture would be consistent with these kinds of places. 8. I’m up on Quadra Island at the moment, and Pete and I searched through the online Daily British Colonist and found no mention of “the Giant of Happy Valley”, so it doesn’t seem this was a well-known tourist attraction or anything. Anyway, I’ll be the first to admit this doesn’t look like a “typical” Northwest Coast sculpture. And I don’t want to do some sort of weird exercise in cherry-picking this and that to shove this thing into a preconceived box. But what do we really know of monumental figures from southern Vancouver Island? Not much, I reckon. Coast Salish art is often overlooked in favour of some of the more rigid formline NW Coast Art. Its not as well documented and it’s not what most peoples’ minds go to when thinking of the regional artistic heritage. I think there is as much reason to suppose this is a scavenged and mutilated monumental Coast Salish sculpture, which perhaps once welcomed people to a Metchosin village, or memorialized the dead at a graveyard, as there is to think it is the odd product of an eccentric settler. If so, it’s a rather important piece, and one that should be repatriated, if it still exists. The giant of Happy Valley Esquivalt(?) [sic]. Sent to Professor Flower at Nat Hist Mus and returned to the owner Left McCallum. Source: British Museum. This entry was posted in anthropology, First Nations, history, Northwest Coast, Vancouver Island and tagged art, Coast Salish, Colwood, Esquimalt, Metchosin, Salish, sculpture, Songhees, Victoria BC. Bookmark the permalink. “was born in St. Petersburg, Russia in 1839 of British parents. He entered the Imperial British Army and rose to captain in the 91st Argyllshire Highlanders. During the 1850’s he commanded an elite guard to protect Queen Victoria from the Fenian (Irish terrorists) threat. Captain McCallum retired from the army and immigrated to Canada in 1886. The McCallum’s first residence in Victoria was the Old Admiralty house off Esquimalt Road. Later they settled in Colwood. McCallum obtained notoriety in 1885 when he purchased what was called the ‘stoneman’ and attempted to export it to the British Museum claiming it to be a petrified human. Originally shipped from San Francisco, it was in fact a piece of rock shaped like a man that had been buried and dug up a few years later in Sooke. McCallum bought the item and was attempting to ship it to England when he was stopped by a Mr. Collector Hamley, head of Customs Victoria. McCallum was later involved in a number of litigations over some of his many purchases…”. The timing is right, since this McCallum died in 1899, in the ballpark when the photo was taken. The person who rather rudely commented (now deleted) that it was a giant Jesus might well be right, Pete and I discussed that. The raised shoulders and sunken abdomen are consistent with that. But McCallum in England may have been, I think, under the impression he had an ethnographic curio, for him to take it to what was then a division of the British Museum. That Colwood site looks interesting but throws up a .aspx error in both firefox and chrome. Hmm, the McCallum I was writing about is buried at the Colwood pioneer cemetery… It seems, in my reading, that he may have been an amateur antiquarian trying to cash-in like other settlers of this era. There was certainly a market for this. The happy valley figure could be a historic and non salish carving, but its the face that is so evocative of the kind of skeletal motif present in the earlier art of the region. Maybe a syncretism of christian/salish mortuary statuary? Plus, how many crucifixions have you seen that depict His genitalia? 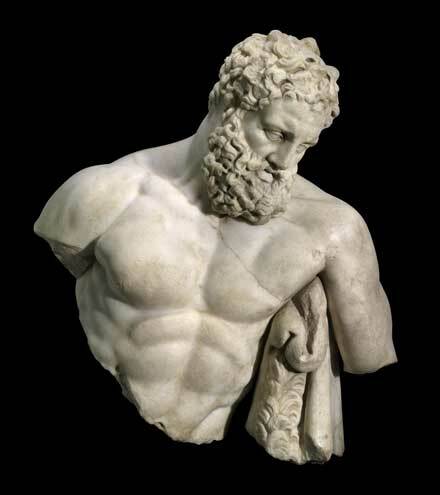 Here’s one by Michaelangelo (and no you dont’t want to see the rest of my google results….) so I guess it’s not unknown, but very much the exception. I like the syncretism idea – cultural remix; emulation of the obviously important Christian iconography with a Salish sensibility through supersized outdoor sculpture. Did you check with the database at the Royal BC Museum? The Ethnology Collection or Anthropological Photos collection may have something. Brian Seymour manages that collection (Ethnology) 250 387-2440. Thanks Kim, good idea. I quickly searched the online BC Archives and didn’t find anything of note. Asking Brian would be a good idea. It’s such a striking sculpture that I almost feel like if it wasn’t buried in a vast British Museum archive it’d be quite well known in these parts or to this crowd…. Rather than being a hoaxer himself, it seems McCallum was the dupe of conmen. The most relevant issues of the Colonist (there are others, all viewed free at http://www.britishcolonist.ca/index.html) are Aug 15, 1885, p3, “The Petrified Giant” and Feb 18, 1887, p1 “The Hope of the Liberals”. The Happy Valley stone man was carved of limestone, then imported from San Francisco, buried for a time in Happy Valley, then dug up, publicised, and put up for sale. It seems like everyone knew it was a fake except McCallum. It may have been around for some time. “The patent artificial stone man is doing Winnipeg. Wary Winnipeggers can learn something of this enterprise by writing to almost anyone in Victoria, B.C.” Aug 29, 1879. p2. McCallum arrived in Victoria after this date. He later ran for MP, but his opponents never let the public forget that he was a fool who had been taken in by the stone man. “The gallant captain is a susceptible individual… as much taken in… as he was by the famous Happy Valley stone man…” (Feb 04, 1887, p2, “Political Notes”). “This city and district might as well send a stone man to Ottawa as Captain McCallum” (Mar 04, 1887, p2 “The Do-Nothings”). Thanks twoeyes! Um, speaking of hilariously awesome sleuthing, how many fish bones have you counted in your career — so far? Pete – you might just have nailed it. Wouldn’t it be great to be able to relocate the “stone man”? You’re right that it does look like stone in places (though the heartwood grain effect on the right hand side is still there). The cracking looks more like stone than wood. We still don’t know if McCallum went to the UK and he died right around this time. Further the name “Left” McCallum isn’t right. And the caption does seem to strongly suggest the actual statue was taken in to the museum and then returned. Still I have a feeling you are right and this is the Happy Valley Stone Man. Do any other pictures of it exist? That would clinch it perhaps. It really looks like tufa that’s quarried in southern BC, widely available at places like Burnco in Alberta, soft easily carved stone, it often has grain to it of harder minerals.